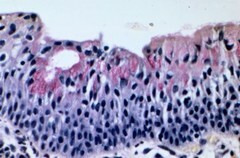 A vaginal adenosis with a single mucinous layer of coumnar epithelium lying on the surface of metaplastic squamous epithelium (center of top half of photograph). To the left, the mucinous epithelium appears to line the neck of a gland in the lamina propria (H&E, x 250). The mucin stains red with a stain specific for mucin (lower half of photograph, mucicarmine stain, x350).